(Photo: © Peter Kenny / Ecumenical News)Contemplating: World Council of Churches General Secretary, Rev. 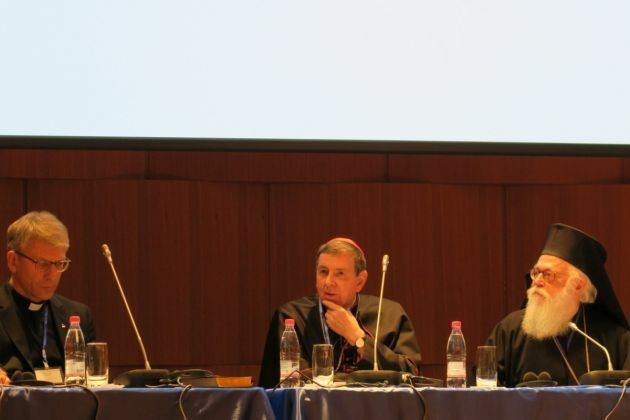 Olav Fykse Tveit; Cardinal Kurt Koch, who heads ecumenical matters for the Holy See and Albanian Orthodox Archbishop Anastasios on Nov. 2, 2015 at a meeting of global Chrsitian leaders entitled, "Discrimination, Persecution, Martyrdom: Following Christ Together" held in Tirana, Albania. TIRANA, Albania - It was a unique and significant gathering of leaders from ever tradition of Christianity to discuss discrimination and persecution, made in a land that brutally banned all expressions of faith in any manner during the 20th century. The global gathering of 145 people took place from Nov. 2-4 in Tirana, Albania, a country that was declared by its constitution to be an atheist state in 1967, and now has flourishing churches in a framework of religious freedom even though some discrimination may remain. Coming from Africa, Asia, Europe, the Middle East and North and South America, they asked all governments to respect and protect the freedom of religion and belief of all people as a fundamental human right. They sought solidarity from all Christians and also repentance for having at times persecuted each other and other religious communities in history, seeking one another's forgiveness and news way's of following Jesus together. "It was the first meeting in modern history of Christianity high level leaders and representatives of the various Church traditions gathered together to listen to, learn from, and stand with discriminated and persecuted Churches and Christians in the world today," the organizers said. Entitled Discrimination, Persecution, Martyrdom: Following Christ Together, the meeting was convened by the Global Christian Forum together with the Pontifical Council for Promoting Christian Unity (Roman Catholic Church), the Pentecostal World Fellowship, the World Evangelical Alliance, and the World Council of Churches. It was organized in close collaboration with the Orthodox Autocephalous Church of Albania, the Albanian Bishops' Conference, and the Evangelical Alliance of Albania. "We have come together because discrimination, persecution and martyrdom among Christians and people of other faiths in the contemporary world are growing due to a complex variety of factors in different realities and contexts," they said. "We also appeal to governments and international organisations to respect and protect Christians and all other people of goodwill from threats and violence committed in the name of religion," they said. The Christian leaders said, "As we follow Christ, Christians can be exposed to any form of persecution, suffering and martyrdom, because the sinful world is against the Gospel of salvation. "But from earliest times Christians experienced the hope and reality of the Resurrection through walking the way of the Cross. Together we follow Christ as we 'hunger and thirst for righteousness' (Matthew 5:6) for all." They noted that the life of the Church for centuries in proclaiming the Gospel of Christ has entailed "the shedding of the martyr's blood." Without referring to any country or area the Christian leaders noted that the 21st century is full of moving stories of faithful people who have paid for their dedication to Christ through suffering, torture and execution. Christian martyrs unite us in ways we can hardly imagine.